Ultimately, an angler improves their fly fishing ability the most through practice. Yet, through reading and research, anglers can greatly improve their knowledge of aquatic habitats - leading to more productive time on the water. Other books that are very helpful are books about casting. While a book is no substitute for real life practice, a book can frequently illustrate problems in a cast that an angler didn't realize existed. And finally, beginner anglers will enjoy the many fine guidebooks that lead new anglers through the sport of fly fishing - from what the sport is, to the type of gear used and why, and the ABC's of getting started. The Orvis Fly-Fishing Guide, Completely Revised and Updated - A fully illustrated and comprehensive book about fly fishing, this book has been helping anglers for over twenty years. Guide to Fly Fishing Knots - An easy to use an in-depth guide to tying knots used for fly fishing. The L.L. Bean Ultimate Book of Fly Fishing - This book is divided into four parts--General Fly Fishing, Fly Fishing for Bass, Fly Casting, and Fly Tying--and covers each with in-depth analysis. The Orvis Ultimate Book of Fly Fishing: Secrets from the Orvis Experts - Fly-fishing strategies and techniques, from Orvis's world-famous team of experts. Rich and helpful color photos and drawings. Fly Fishing for Beginners (The Freshwater Angler) - Veteran fly-fishing instructor teaches the basics of fly fishing. Book designed for the beginner and new angler. The Orvis Guide to Beginning Fly Fishing: 101 Tips for the Absolute Beginner - Here are fishing ethics, helpful safety advice, basic angling terms, everything the new fly fisher needs in a crisp, helpful, and finely illustrated primer of the highest rank. 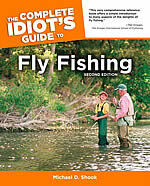 The Complete Idiot's Guide to Fly Fishing - From understanding how to “read” fish to devising strategies for stream, river, and dam fishing to creating and casting flies, this book offers both beginning and seasoned anglers a comprehensive overview of this specialized sport. The Orvis Guide to Small Stream Fly Fishing - The definitive and comprehensive guide to fishing small trout streams throughout North America. The book provides all the information for finding and fishing unspoiled gems. This beautifully illustrated and definitive resource explains the small stream environment, how to find these streams, how small-stream trout behave, how to read the water, special casts, fly selection, and how to present the fly in all types of small streams. Fly-Casting Fundamentals: Distance, Accuracy, Roll Casts, Hauling, Sinking Lines, and More - Expert Lefty Kreh lays the groundwork for learning to cast, including teaching and practicing tips. Reading Trout Water: 2nd Edition - Learn how to find trout by studying currents, temperatures, oxygen levels, and food sources. Covers every water type--riffles, runs, pools, flats, pocket water, bank water. Handbook Of Hatches: Introductory Guide to the Foods Trout Eat & the Most Effective Flies to Match Them - In Handbook of Hatches, Hughes teaches how to match the hatch and not worry about identifying the insect until later, and to fish better, focus on shape, size, and color to choose the best fly for the situation. Dynamic Nymphing: Tactics, Techniques, and Flies from Around the World - Complete guide to advanced nymphing techniques. Trout From Small Streams: 2nd Edition - Hughes draws on his years of experience to teach you everything you need to know about fishing small streams, from choosing rods and flies to reading the weather and water.